In 1924 Rudolf Steiner established the School of Spiritual Science within the framework of the newly refounded Anthroposophical Society. This volume represents a first attempt at describing the character, intentions and working methods of this pioneering School, and its place within modern cultural life. It describes the School's three prerequisites for membership and studies its connection with the Anthroposophical Society and movement. It also examines the role of its 'First Class' in relation to Rudolf Steiner's original intentions, and the responsibilities of its representatives. 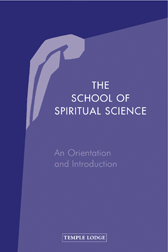 The bulk of the book is taken up with descriptions of the various sections within the School of Spiritual Science, contributed by the individuals currently responsible for their leadership. These descriptions indicate how the School connects with daily work in various areas of life, in keeping with an esotericism based on the idea that 'life and its depths can be confronted in the most energetic way'. Also featured is much practical information, including a description of the process for becoming a member, and an appendix containing significant statements by Rudolf Steiner. In keeping with the transparency that Rudolf Steiner requested from the outset, this book is suitable for anyone interested in the School of Spiritual Science.